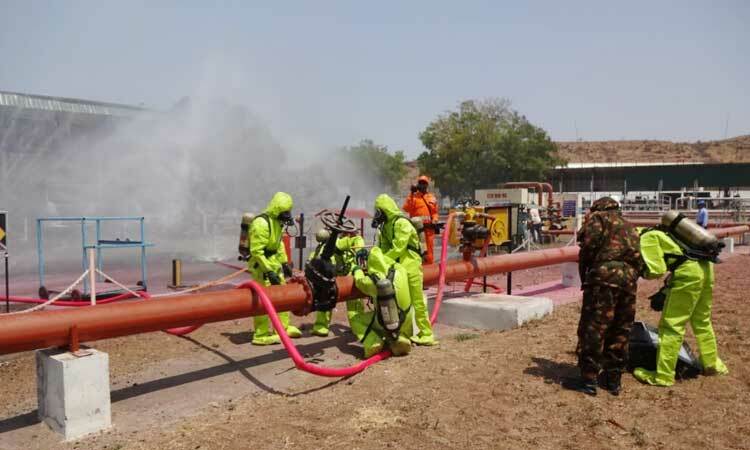 Pune : Np News Network – Maharashtra State Disaster Management authority (SDMA) & NDRF conducted ‘Tatpar-2019’ a joint mock exercise on multiple disasters like Terrorist attack, Fire, Chemical Emergency, Radiological Dispersal Device (RDD) today at Indian Oil Corporation Ltd. LPG Bottling plant near Village Bhose, Chakan — Shikrapur road, Pune, Maharashtra on Friday. Apart from CBRN team of 05 BN NDRF, State Disaster Management Authority, Disaster Management Branch, District Magistrate Office Pune, QRT of Pune Police, QRT of 242 BN Central Reserve Police Force, State Disaster Response Force Dhule, Directorate of Industrial Safety and Health, Hindustan Petroleum Corporation Limited, Bharat Petroleum Corporation Limited, Disaster Management Department Pimpri-Chinchwad Municipal Corporation, Fire department Pimpri-Chinchwad Municipal Corporation, Fire department Maharashtra Industrial Development Corporation Chakan, Civil Defence, Local Police, Staff of Indian Oil Corporation Limited and local villagers participated in the exercise. Table top exercise for this State level mock exercise was conducted on 04/04/2019 at Indian Oil Corporation Ltd. LPG Bottling plant to understand the capabilities of all stakeholder agencies. On 05/04/2019 all stakeholder agencies participated in this mock exercise to ensure multiagency coordination and integrated response during disasters. The exercise was successful in identifying gaps in preparedness levels and response. It also showcased capabilities of all organizations. The exercise was successful in achieving its goals of better coordination and response during disasters.